I’ve dipped the proverbial toe into the Bay Area jazz scene. In the past three weeks I’ve been to a few jam sessions and even played a handful of gigs. It’s very strange starting over in a new city after having been in New York for so long. When I moved to New York I was a comparative kid — just 24. Now I’m a 50-year-old man, set in my ways. I’m crusty and curmudgeonly –moldy and figgy. Even though work-wise I find myself in the same place I was two and a half decades ago, the situation is not entirely the same. Back then I was callow and unsure of myself. I was awed and not a little intimidated by the size and energy of the New York scene. Now, after having been beaten, brutalized, and molded by New York, I find myself with a great deal of self-assurance. I know what I can do and what I am capable of. The challenge is to check my ego at the door. Nobody here owes me anything. Hell, nobody even knows me. I am aware of the cache that comes with being a “New York” cat, but in a certain sense there is a fine line one must walk. It’s not right to come on too strong –“I played with so -and-so,” or “I played at [insert name of venue here].” The New York brand can work for or against me. At first glance the Bay Area scene does not feel nearly as cut-throat. People have been friendly, yet guarded, which is understandable. This scene has taken a big hit with clubs closing, or barely staying alive. What do they need another pianist for? At the same time people have been welcoming — I’ve been able to sit in at the sessions and have met some good players. I’m happy with what has transpired so far. I’ve found a couple of good sessions in San Francisco which has yielded hanging destinations for Sunday, Monday, and Thursday. A few of these sessions have led to gigs — nothing that spectacular as of yet, but how good does it feel to be working again, no matter how little the pay, after a three-month layoff! As I thought, the initial plunge was going to be the hardest. Now that I’ve taken it things don’t look quite as dire. 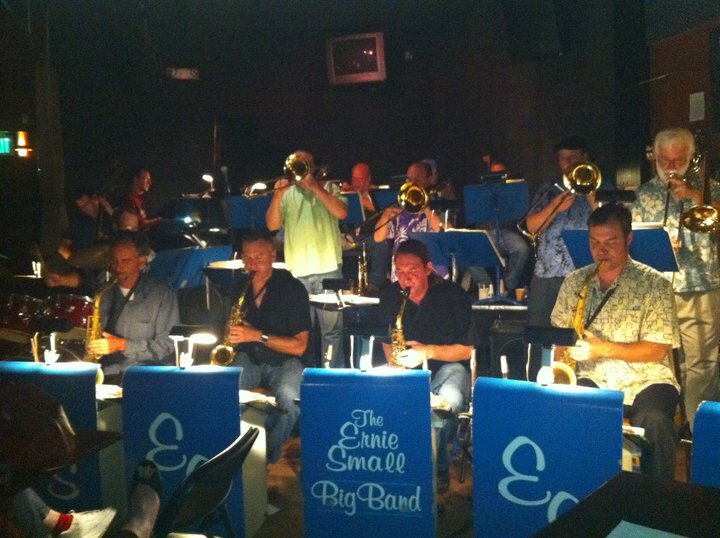 Here is a photo taken of a big band gig I played in San Francisco last Sunday. I’m in the back! This entry was posted on October 2, 2010 at 1:38 am	and is filed under music, San Francisco. Tagged: gigs, jam sessions, jazz, New York City, San Francisco. You can follow any responses to this entry through the RSS 2.0 feed. You can leave a response, or trackback from your own site. I always wondered how the jam sessions worked. Did you just ask them to sit in?